Larry Walty Roofing & Guttering, Inc.
Wichita, the largest city in Kansas, is home to more than 670,000 people. This vibrant, diverse city combines a bustling college town vibe with upscale dining, a funky arts scene, and a variety of booming businesses. Named as one of the "Top 10 Best Places to Live" by Money Magazine, Wichita attracts everyone from college students to growing families. Even though Wichita skies are blue most of the time, blustery winds and strong storms can loosen roofing shingles, puncture through roofing materials, and damage gutters. 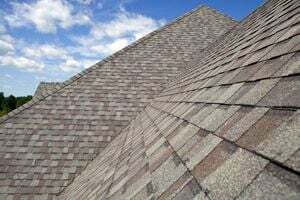 Luckily, the city has a variety of skilled, reputable roofing companies to inspect, repair, and replace roofs, making it easy for Wichita residents to enjoy having a solid roof overhead. Prices can fluctuate depending on the size and pitch of the roof, required layers, roofing materials, and local code requirements. Start by considering the local average costs. It's also helpful to keep in mind that roofers may charge by the job, the hour, or the square-foot. Ask for a detailed estimate from the roofing company before starting any roofing work. People interested in finding a skilled, efficient roofing company should look for services that are licensed, bonded, and insured. Licensure demonstrates the company's compliance with state and local laws. Although Kansas only requires roofing companies to register with the state, Wichita roofing companies need to obtain a building contractor license from the Metropolitan Area Building and Construction Department in Sedgwick County. To be eligible for the license, the business must show proof of insurance. Choosing a bonded company provides extra consumer protection. Bonding ensures that the project is completed, and it provides compensation if the roofing company fails to finish the work. Insurance protects both businesses and consumers from the added costs of accidents or damages. Downtown- The revitalized downtown housing market features hip apartments and lofts that appeal to young professionals and singles. Residents enjoy being close to all the action, including being within walking distance of the Orpheum and the nightlife in Old Town. Riverside- Known for its gorgeous historic architecture and variety of home styles, the Riverside neighborhood appeals to many different types of people. Pedestrian-friendly and close to downtown, this culturally diverse neighborhood has a lot to offer. It's home to the Wichita Gardens and the Old Cowtown Museum, along with a charming array of Victorian homes and bungalows. Cottonwood Village- Located fewer than 10 miles from downtown, Cottonwood Village offers a combination of big city living and a family-friendly atmosphere. Outdoor recreation abounds with plenty of green spaces to play with the kids, hit the bike trails, and go fishing. A low cost of living and a booming nightlife make this area equally attractive to young professionals. Although Wichita enjoys an average of 221 sunny days every year, it does receive some precipitation. Having a structurally intact roof overhead can prevent unsightly leaks and water damage. Even a small crack in the flashing or a missing shingle can affect the interior of a home. Homeowners who want to take advantage of the Wichita housing market’s slow and steady growth should consider investing in the roofs of their houses. An attractive roof that fits the architectural style of a Wichita home can add value to the home while increasing curb appeal exponentially. Prospective buyers typically don't want the headache and hassle of roofing problems, which is one of the many reasons that replacing or repairing the roof is an important task prior to listing a home for sale. Investing in the roof makes the home more attractive while adding value. Comment: This is a potential purchase of a home with a roof that is 27 years old. Iâm looking for an estimate to help drive price concessions to offset the cost of roof replacement. Freedom Roofing and Guttering, Inc.
Wichita Roofing Contractors are rated 4.79 out of 5 based on 318 reviews of 23 pros. Not Looking for Roofing Contractors in Wichita, KS?